Glenn Close is one of those actresses who, no matter what age group you belong to, you’ll have seen in at least one memorable movie in your lifetime, whether it be films like Fatal Attraction, Dangerous Liaisons, The Big Chill, 101 Dalmatians (which is the very film that introduced me and several other people my age to her wondrous screen presence) and even Guardians of the Galaxy. She is also someone who is so highly regarded as an actress, yet has never won an Oscar despite six nominations throughout her career, making her the Martin Scorsese of actresses right now (but at least Scorsese eventually won; Close has yet to do so); and with The Wife, should the filmmakers and distributors play their cards right, it could very well add up to seven, because Close is the quiet but firm beating heart in this heartbreaking tale of love, honour and Swedish award ceremonies. Close is Joan Castleman, the shy and quiet wife of renowned author and scholar Joseph Castleman (Jonathan Pryce), who both one morning wake up to a phone call direct from Sweden, which tells them that Joseph has just been named the latest recipient of the Nobel Prize in Literature, as a culmination of his celebrated body of work over the years. As the two travel to Stockholm to receive the honour, their relationship beings to reach boiling point as Joseph frequently condescends to his wife in front of his peers, while Joan struggles to contain a secret she’s been holding onto for the entirety of her marriage, something that the presence of a wannabe-biographer (Christian Slater) only intensifies. In flashbacks to the late 1950s, we also get to see this couple’s origin, when Joan (played by Annie Starke, Close’s real-life daughter) was merely a writing student of Joseph’s (Harry Lloyd) who eventually catches his eye despite already being married and with an infant daughter; it is these scenes that spell out the couple’s relationship beyond just mere affection, and we learn a lot more about this secret that Joan has been keeping all these years as well as how and why it is only now that things are coming to a head. The film is a fascinating character study of not just the titular wife, but also the man that she is wife to; Joe is someone who you can tell right away is more than willing to bask in his fame and glory, especially now that he has been awarded one of the highest honours anyone can ever achieve, while Joan seems way too comfortable being a silent figure in the background, existing only so that Joe can lavish affection on her during speeches and undermine her intelligence and status whilst talking about her to friends while she is present. It is also evident, though, that by this point in her marriage she has had just about enough of being side-lined and neglected, especially as he is known to have had a number of infidelities over the years and has up until now stuck by him regardless, for reasons that are made abundantly clear later on. The quiet sadness is all over Close’s face, even as she’s smiling and nodding along to her husband’s many put-downs, and you can just see the rage and resentment that’s just waiting for the right time to escape from her system; it’s a masterclass of subtle acting by Close, who up until the final few scenes delivers an unshowy but still powerful portrayal of someone with things to say, but no idea when or how to say them. Pryce, a damn fine actor in his own regard, is also given a lot of material to play with, as someone who clearly has allowed his years of success to get to his head, while also hinting at a feeling of self-hatred which is capitalised by his continuous unfaithfulness to his wife and his natural need to condescend to her and also his grown son (Max Irons), himself a struggling writer whose desire for his father’s approval has made him bitter and resentful. There are moments in both Close and Pryce’s performances that will have you astonished by how dysfunctional their relationship can really be, but still show that there is still genuine affection for one another; there’s a scene where Joan angrily confronts him about yet another possible affair, this time with a young Swedish photographer, which is then interrupted by some very good news for both of them, and then they’re back in each other’s arms once again laughing, crying, and comforting each other like two of the happiest people you’ll ever meet. These types of scenes really do bring out the best in both actors, as you can see the wide range of emotions being felt from both parties whether they’re in conflict or agreement, but you still get the sense that these are two fully-functioning characters who have their own versions of happiness and love, even if theirs is extraordinarily unconventional. This is very much an actor’s movie, one where the type of performances they give very much carry the film, especially Close who is so quietly riveting here that her silence could cause avalanches; but the rest of the film, from Björn Runge’s slight and noticeably European direction to Jane Anderson’s screenplay (adapted from the novel by Meg Wolitzer) to the classical music score by Jocelyn Pook, is admirable in many of its other areas and makes for an effective and heartbreaking drama. In the end, however, it’s the two lead performances that are truly the stars of the show, particularly by Close who, once again, could very well be looking at Oscar nomination #7 if, and that is one big IF, this movie and the filmmakers play their cards right. Either way, whether it’s for this film or another one in the future, Glenn Close’s time is bound to come very soon. 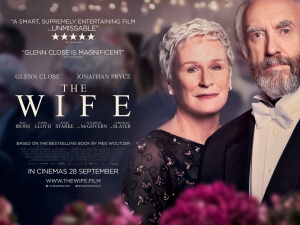 The Wife is a heartbreaking and exceptionally acted drama, firmly held together by two great lead performances by Jonathan Pryce and especially Glenn Close, who could very well be looking at a seventh Oscar nod for her role in this film.